Somebody once told me that your mobile when your not using it can do the same. Listen in on your conversations unless you take the battery out which a lot you cannot do to. Might be some truth in it. 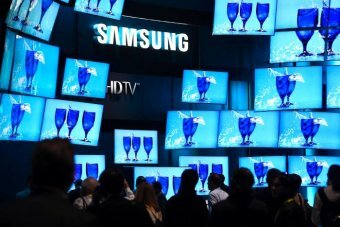 Customers with Samsung's new Smart televisions are being warned that what they say could be recorded and distributed to a third party. The policy advises customers to "please be aware that if your spoken words include personal or other sensitive information, that information will be among the data captured and transmitted to a third party through your use of voice recognition." Voice recognition technology is already used on most smartphones, but what troubles some observers about smart household goods like televisions is that customers may not always be aware when their new gadget is listening in. "I suppose the interesting difference between the televisions and the phone example is when you're dictating into a phone you know exactly what you're doing, whereas with a television you might just be sitting around chatting to your friends and you're inadvertently activating this voice command technology which will start recording what you're saying," Jake Goldenfein, from the centre for media and communications law at the University of Melbourne, said. Luke Hopewell, editor of online technology journal Gizmodo, said "big brother" may not be actually listening to what we say just yet, but more how we say it. "When it says don't discuss personal information in front of your TV, what it's actually saying is that identifiers of your voice are being sent to third party services when you're using this television," he said. "LG has a very similar clause in its terms and conditions as well." Mr Hopewell said the third party sources are not so much keeping recording as keeping data point. "Those data points mean what your voice inflection sounds like, which words that you said," he said. "For example, the Australian accent in particular is very difficult to decode. "Samsung work with people at Macquarie University to actually figure out what people were saying before they could bring voice recognition to Australia... so it's about getting a better quality of service, but it really raises questions about what we're going to do in the smart home in the future. "This is the first time people have actually recognised that this might be a problem if we start giving all our information over in our smart home to third party services."